Derived from the Choctaw Indian words "okla," meaning people, and "humma," meaning red, Oklahoma was designated Indian Territory in 1828. By 1880, sixty tribes, forced by European immigration and the U.S. government to relocate, had moved to Oklahoma. Congress opened part of the region, which the United States had acquired in 1803 under the terms of the Louisiana Purchase, to settlement by non-Native Americans in 1889 and organized the Oklahoma Territory in 1890. In 1907, the state of Oklahoma incorporated what remained of Indian Territory. 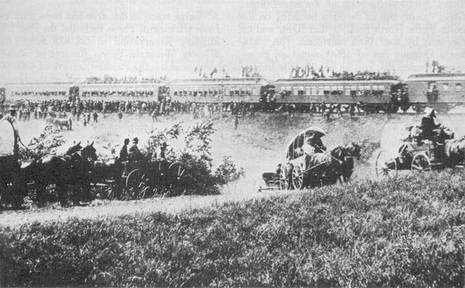 Delegations to make the territory into a state began near the turn of the 20th century, when the Curtis Act furthered the allotment of Indian tribal lands in Indian Territory. Attempts to create an all-Indian state named Oklahoma, and a later attempt to create an all-Indian state named Sequoyah failed, but the Sequoyah Statehood Convention of 1905 eventually laid the groundwork for the Oklahoma Statehood Convention, which took place two years later. 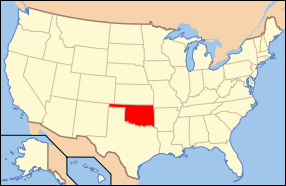 On November 16, 1907, Oklahoma was established as the 46th state in the Union. The new state became a focal point for the emerging oil industry, as discoveries of oil pools prompted towns to grow rapidly in population and wealth. Tulsa eventually became known as the "Oil Capital of the World" for most of the 20th century, and oil investments fueled much of the state's early economy. In 1927, Oklahoma businessman Cyrus Avery, known as the "Father of Route 66", began a campaign to create U.S. Route 66. Using an existing stretch of highway from Amarillo, Texas to Tulsa, Oklahoma to form the original portion of Highway 66, Avery spearheaded the creation of the U.S. Highway 66 Association to oversee the planning of Route 66, based in his hometown of Tulsa. On Nov. 16, 1907, the Union admitted its 46th state when Indian Territory and Oklahoma Territory combined to form the new state of Oklahoma. Residents throughout the state celebrated with wild jubilation and a “red letter” campaign. An unusual aspect of the festivities was a marriage ceremony symbolized the merging of the two territories.